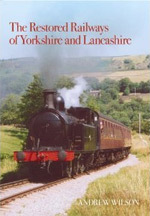 This illustrated volume describes the history, both pre-preservation and post-preservation, of the Yorkshire and Lancashire preserved railways, including Keighley and Worth Valley, North York Moors, Embsay Steam Railway, Middleton Railway, Kirkness Light Railway, and East and West Lancashire Light Railways. The history of each line is complemented by maps and photographs, and looks at routes, rolling stock and unique features. Railway author Andrew Wilson has created a detailed and informative history of the development of the preserved railways of this region, of interest to both railway aficionados and the casual visitor.